Explore solar energy today to help us move toward 100% renewable power. Environment America and Energy Sage are partnering to help you shift to renewable energy and lower your electric bill. Environment America advocates for policies that protect the places we love and the environmental values we share, such as clean air, clean water, clean energy and open space. We're encouraging everybody -- communities, colleges, companies and states -- to shift to 100% renewable energy. 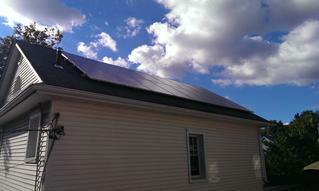 To help families and individuals go solar, we're partnering with Energy Sage. Solar power is surging. The past year saw our one-millionth solar installation, as cities across the country made huge gains in solar capacity. But we're just getting started. Now is the time to go solar and help us reach 100% renewable energy.